If you need more lift capacity than the HD-7 series offers, the HD-9 features 4,082-kg. of lift. This parking lift is one of the highest-selling we make for a reason: 4,082-kg. is enough to cover light-duty trucks and SUVs, and the unit fits in the average parking space. Why do so many DIY’ers and technicians choose this BendPak? It’s simple. This parking lift fits into almost every garage with clearance and dimensions of a normal parking space. Lower ceilings or more narrow spaces are generally not a problem! 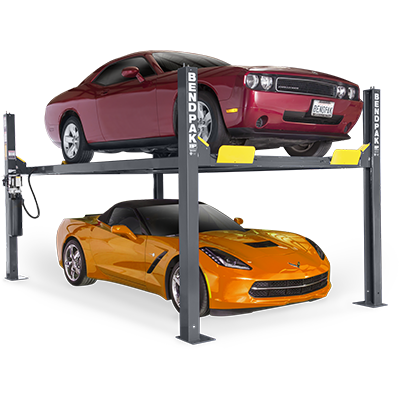 All you need to know are your garage dimensions and lifting needs, and a BendPak representative will outfit you with the best parking lift money can buy. The HD-9XW four-post lift achieves a formidable 2,083 mm rise and features extended-length columns, perfectly accommodating higher-clearance vehicles. Its standard width also makes it ideal for smaller bays and space-conscious home garages. In order to park high-stance trucks and SUVs in the lower parking level, you need more height. The HD-9STX is ideal for space-restrictive bays and home garages that could benefit from the lift's slimmer proportions. This model is popular in garages with ceilings that offer a little extra overhead clearance. The HD-9ST is a narrow, standard-height ​lift that's perfect for the average one-car or two-car garage. Multiple units are easier to fit side-by-side, doubling your parking in ways you never thought possible. Those inches you save with this lift go a mile when it comes to installing this lift in tighter spaces. When space is less of an issue, and you've got big machines, you need more rise from your parking lift and extra room on the sides. That's exactly what the HD-9SW offers. The extended all-around proportions will accommodate wide trucks without damaging their big mirrors, and its 2,083 mm rise is ideal for raised suspensions and anything else that needs more room underneath. Cable sheaves aren’t the car lift part most people notice or think about... unless these parts malfunction. With periodic maintenance, however, BendPak’s dual hub cable sheaves are more robust and longer-lasting than the thin, narrow sheaves manufactured by our competition. More surface area for the cables to run through means less wear on the wires, and that of course means a more durable parking lift. BendPak car lifts feature many lock points, so you have more choice as to where and how you work. The only choice you don’t have is in safety: this parking lift is over-engineered beyond belief. It features industry-leading, automatic spring-loaded locks that engage as the ​lift rises and disengage the moment it descends. When the lift stops, the locks re-engage automatically. Who said absolute safety has to be complicated? The wires that make up our cables are aircraft-quality; each cable is able to safely hold ​6,532-kg., making the lift capacity of the cables alone 640% more than the 4,082-kg. certified rating. In other words, with just periodic lubrication provided by the user, your cables will last for many years of safe use. An integrated electric-hydraulic power system is controlled with the touch of a button. It ensures a balanced rise, safe descent and simultaneous lock release at all times. It’s never been easier to operate a parking lift. All seven models feature the same ergonomic control panel placement for your convenience. Column stability is essential to the safe operation of your parking lift. To make sure your car ​lift never wobbles or wavers under heavy load, the base plates of each HD-9 model feature 254 mm x 305 mm dimensions. We simply refuse to skimp on safety or cut corners just to use less steel. You might have a vehicle parked up top for days, weeks or even months! You deserve to know it’s safe up there. Creating garage space has never been easier. Caster sets can be optionally added to make your parking lift mobile. This is perfect for any shop or garage than wants to diversify how space is used. These wheels make it easy to adjust and reposition the lift. Feel free to keep your car on top while you move it! All lifting cables, airlines, safety latches and sheaves are safely tucked away into the parking lift structure. They’re not invisible to you, however, so you’re always able to keep an eye on your operations. Internal cables and latches means the precious components that actually move your lift platform are not subject to conditions that may be out of your control (e.g., weather, sudden spills, accidents, tangled clothes). There are parking lifts out there that will rub against your low-bodied vehicles upon approach. Our runways feature a low-profile rise of only 114 mm. No marring, no surprises. In addition to our low-profile runways, the onboard ramps are extended to keep those sports cars extra-safe. Low ground-clearance vehicles will always mount and roll off our parking lift structures with ease. Spring-loaded safety locks automatically engage at each ladder position, and they do so continuously as the lift rises. When the platform stops, all four locks will be engaged in a lock position and the lift platform will be even. When the ​lift descends, they all release at once. A secondary slack-cable detection system will shut down the entire ​lift application if slack is found in the cables, meaning you can park your vehicles and feel assured that they are protected from virtually anything and everything that could possibly happen.